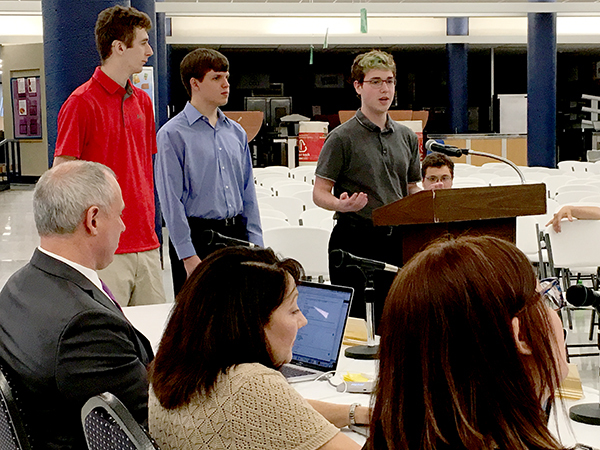 Three students in Jeremiah Simmons' Computer Science Capstone class at Pattonville High School gave a presentation to the school board on May 22 about the Pattonville Event Manager, an online school event management system they created as part of their class. Gregory Bahr, Kyle Murphy and Michael Pieper (shown below) showed the board how the system was used to sell tickets to dances such as homecoming and prom and also manage check-ins at the events. The goal of the system was to improve the experience of students attending school events by speeding up the ticket sales/check-in process and eliminate the need for event organizers to use spreadsheets in order to run the event. Students were able to scan their school IDs to purchase tickets and check in at events, eliminating the need for physical tickets. The program can also be used to save event data and check the eligibility of each student registering to attend the event. Approved the May 2018 transportation route miles for the 2017-2018 school year, as required by state law.